As educators, we believe that learning opportunities outside of the classroom — in our communities, around campus and in other countries — provide invaluable experience. Some of these opportunities — like student teaching — are part of your degree program. Others provide ways to get involved both on- and off-campus, through research, community involvement, student-run organizations and May Term programs. Talk to someone at the Fried Center for Global Engagement or your advisor for more information about May Term programs that could be a good fit for you. To receive your teacher certification, you’ll conclude your time at Hope with a semester of student teaching. Depending on your specialty and track, you may be eligible to complete your student teaching through The Philadelphia Center, the Chicago Semester Program, the Rosebud Indian Reservation in South Dakota or other cities and countries around the world. Hope College offers Children’s After School Achievement (CASA) as a community tutoring program. Through CASA, we help at-risk students with after-school mentoring. Hope’s Upward Bound program is a set of seven federally-funded outreach opportunities. Hope offers a pre-college preparatory program for students from first-generation college and low-income families. The Program for the Academically Talented at Hope (PATH) was started to serve students in grades 7–9 who showed academic talent and promise, and offers accelerated courses. We receive requests from teachers and parents in the community hoping to hire a tutor. Submiting your name will add you to a list to be contacted with opportunities. We offer events throughout the year to our students and community as a whole, like our community-wide reading program Big Read. Visit Hope’s calendar for up-to-date information. Our local chapter of the Association for Supervision and Curriculum Development (ASCD) is the first student-run chapter in the country to be recognized by the ASCD. Our group provides panels, workshops and events to our student members. Contact our student organizers for information on joining. Our faculty advisors are Tony Donk and Susan Brondyk. Our student-run chapter of the Council for Exceptional Children provides fellowship to individuals with special needs. Although the group is supported by the Education Department, our members come from many different disciplines. Our faculty advisors are Nancy Cook and Jane Finn. Our Tech Team is comprised of students promoting and implementing technology to enhance teaching and learning with our faculty and classmates, as well as with local school districts. Find out more information on our Educational Technology website. Research is a hallmark of Hope College and an important part of our education curriculum. Visit our faculty page for detailed information on a professor’s chosen research topics. We send students to the Michigan Council of Teachers of English (MCTE) and the National Council of Teachers of English (NCTE) every year. 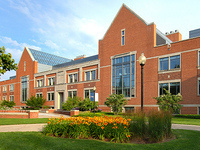 We also participate in the Michigan Association for Computer Users in Learning (MACUL), Michigan Council for Exceptional Children conference, and often have students accepted to National Conferences on Undergraduate Research (NCUR). Not only do students attend these conferences, but they also present their research and from there are asked to collaborate with other professionals or institutions. See what current students are doing and how you can be involved.